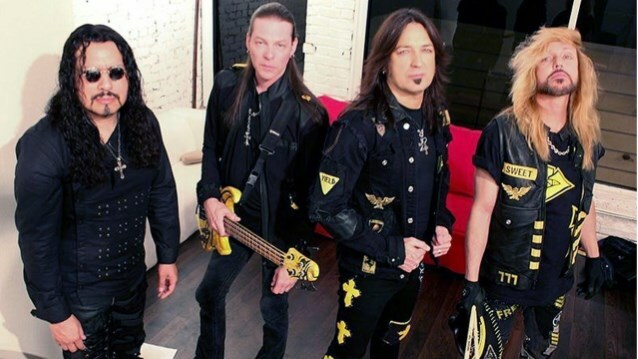 Christian hard rockers STRYPER entered SpiritHouse Recording Studios in Northampton, Massachusetts earlier in the month to begin recording their new album, “Fallen”, for a late 2015 release via Frontiers. Asked if there are still any religious references in the new STRYPER lyrics, Sweet told Canadian journalist Mitch Lafon: “Absolutely. Some of the words themselves are actually taken from the Bible, so that’s still there. The lyrics are definitely on the bold and powerful side. They’re not like the lyrics of old. He continued: “There’s a song about God creating the heavens and the earth. It’s called ‘Let There Be Light’. And it’s about in the beginning, and it’s taken right from Genesis. There’s a song about the Devil; it’s called ‘Fallen’. It just talks about how when the Devil, when he was Lucifer, an archangel in heaven, when he walked, he was the angel of music, and when he walked, there was music. It tells the story in that song of, basically, about how he’s fallen, and why, and how. It’s a real powerful song. 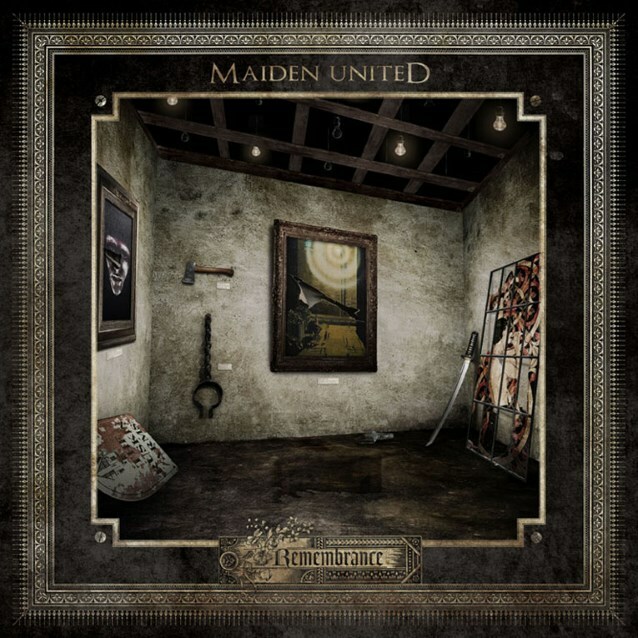 MAIDEN UNITED, the acoustic IRON MAIDEN tribute project featuring Damian Wilson (THRESHOLD, HEADSPACE) and Ruud Jolie (WITHIN TEMPTATION), will release a new album, “Remembrance”, on May 22 on CD, red 12-inch vinyl and as a digital download. “Strange World” was released as a two-track single on CD and iTunes on January 30. MAIDEN UNITED is an IRON MAIDEN tribute project which performs classic MAIDEN songs in new acoustic arrangements. “Remembrance” is the third full-length album released by this project. MAIDEN UNITED‘s debut album, “Mind The Acoustic Pieces” (2010), was an acoustic re-imagining of the entire classic IRON MAIDEN album “Piece Of Mind” with new arrangements. The second album, “Across The Seventh Sea” (2012), contained tracks from different MAIDEN albums. 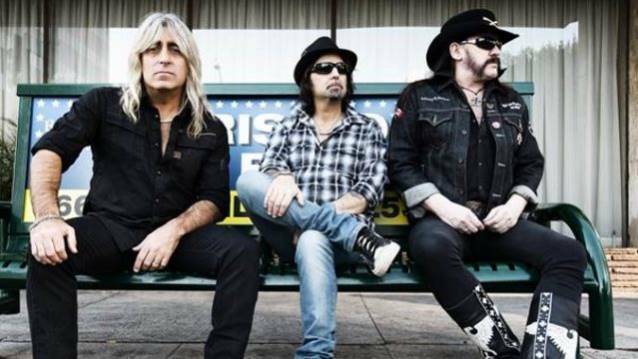 MOTÖRHEAD recently returned to the studio to begin work on its 22nd studio album for a late 2015 release. MOTÖRHEAD‘s song “Heartbreaker” was nominated in the “Best Metal Performance” category at this year’s Grammy Awards. MOTÖRHEAD frontman Lemmy Kilmister, 69, in 2013 suffered a haematoma (where blood collects outside of a blood vessel), causing the cancelation of a number of the band’s European festival shows. He was also reportedly fitted with a defibrillator because of heart problems. The reissue of MOTÖRHEAD‘s 21st studio album, “Aftershock”, was made available on August 26, 2014 via UDR/Motörhead Music. 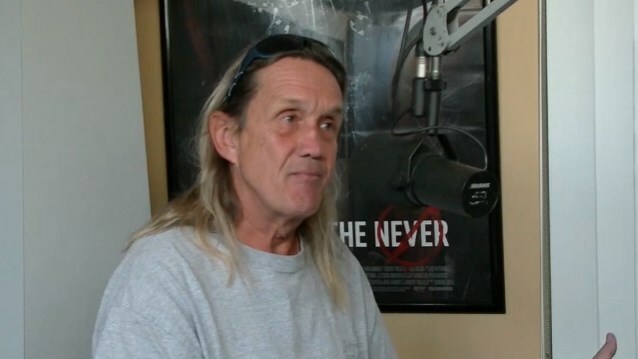 The CD was helmed by longtime producer Cameron Webb (MEGADETH, DISTURBED). The expanded edition contains a bonus live CD — also recorded by Webb — consisting of live material comprised from the band’s historic appearances in early 2014. “Aftershock” sold 11,000 copies in the United States in its first week of release to debut at position No. 22 on The Billboard 200 chart. IRON MAIDEN has yet to make an official announcement about a new studio album, but the band’s members have reportedly been spotted in Paris, France in recent months, along with their longtime producer, Kevin Shirley, who is said to have helmed the new effort. MAIDEN‘s 15th studio album, “The Final Frontier”, sold 63,000 copies in the United States in its first week of release to enter The Billboard 200 chart at position No. 4. The CD featured 10 tracks that had an average running time of seven minutes and 40 seconds, with the shortest song, “The Alchemist”, clocking in at four minutes and 29 seconds, and the longest, “When The Wild Wind Blows”, lasting ten minutes and 59 seconds. IRON MAIDEN‘s previous album, 2006’s “A Matter Of Life And Death”, opened with 56,000 units to land at No. 9. This was a notable increase from the 40,000 first-week tally registered by its predecessor, 2003’s “Dance of Death” (which debuted at No. 18 on The Billboard 200 chart), and that of “Brave New World”, which moved 38,000 copies in June 2000 to land at No. 39 on The Billboard 200 chart. “The Final Frontier” was IRON MAIDEN‘s fourth U.K. No. 1 album. The band previously topped the chart in 1982 with “The Number of the Beast”, in 1988 with “Seventh Son of a Seventh Son” and in 1992 with “Fear of the Dark”. Following consultation with artists, musicians unions, record companies and retailers, it was confirmed today that the release day for new music will be aligned internationally on a Friday. Release days currently vary from one country to another, causing frustration for consumers when music fans in other parts of the world can access new releases before them. As well as helping music fans, the move will benefit artists who want to harness social media to promote their new music. It also creates the opportunity to re-ignite excitement and a sense of occasion around the release of new music. The move to an aligned global release day will also reduce the risk of piracy by narrowing the gap between release days in different countries. Retailers internationally are committed to working with the labels and artist communities to ensure the successful implementation of the move to Friday. From summer 2015, new albums and singles will be released at 00:01 local time on Fridays. Music consumers everywhere will know to look for new releases on Fridays regardless of where they are. Consumer research by TNS across seven markets shows Friday and Saturday as the most preferred days for new music release among consumers who expressed an opinion. More than two thirds of those with a preference (68%) chose Friday or Saturday. The move to a global release day follows several months of discussions between group representing retailers, record companies, artists and musicians unions. * Leading retailers and representative organisations, including Australian Music Retailers Association (AMRA), E.Leclerc, El Corte Inglés, Entertainment Retailers Association (ERA) (UK), HMV, Italian Association of Specialist Consumer Electronics Retailers (AIRES), Media-Saturn, Music Business Association (Music Biz US), Mondadori Retail, the Orchard, Rdio, Spotify, Napster. ACT OF DEFIANCE, the new band featuring former MEGADETH members Shawn Drover (drums) and Chris Broderick (guitar), alongside ex-SCAR THE MARTYR singer Henry Derek Bonner, and SHADOWS FALL‘s Matt Bachand (bass), has inked a deal with Metal Blade Records. ACT OF DEFIANCE is currently recording its debut offering with world-renowned producer Chris “Zeuss” Harris (ROB ZOMBIE, HATEBREED, SHADOWS FALL) for a summer release. Says Broderick: “I am so excited to finally be able to announce ACT OF DEFIANCE to the world. He continues: “I am also very honored to announce that we have signed with Metal Blade Records. There is not a better label to be on than one where the employees (and owner) still understand and listen to METAL! They have shown a loyalty, backing and drive for their artists that few other labels have. Adds Drover: “Having our new band, ACT OF DEFIANCE, sign with Metal Blade Records is a real thrill for me. “I started my musical career with Brian Slagel and the Metal Blade family many years ago, so to come full circle at this point is a real musical homecoming of sorts. I couldn’t be happier about that. 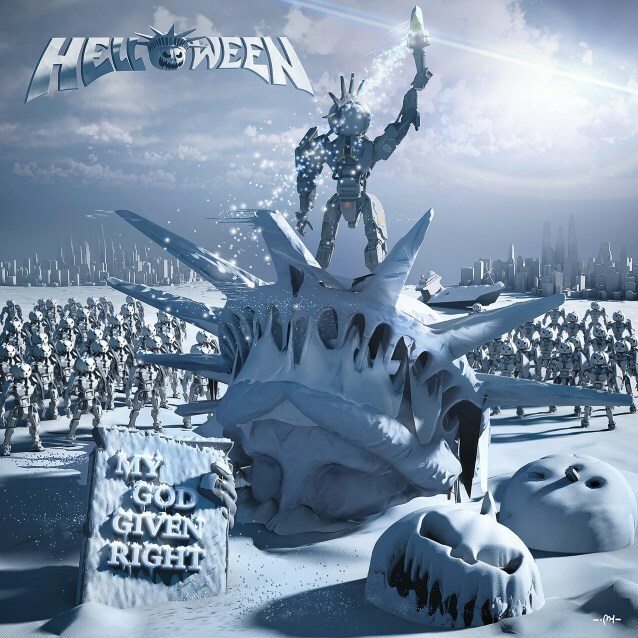 German power metallers HELLOWEEN will release their 15th studio album, “My God-Given Right”, on May 29 via Nuclear Blast. The CD was recorded between October 2014 and February 2015 at the band’s MiSueno Studio on the isle of Tenerife with producer Charlie Bauerfeind (GOTTHARD, HAMMERFALL). The “My God-Given Right” artwork was once again created by graphic guru Martin Häusler (BON JOVI, QUEEN, GOTTHARD) and will also be available as a 3D lenticular print. Says Häusler: “We tried to build a world of ideas, keeping the ‘classic HELLOWEEN‘ elements, like the pumpkins on the one hand and a complete new look on the other, just like we did it the years before, working on a HELLOWEEN artwork. “A first inspiration came from the album title, ‘My God-Given Right’, and some of the song titles, like ‘Swing Of A Fallen World’, ‘Lost In America’, ‘Battle’s Won’, etc. “During my research, I stumbled upon the blockbuster ‘Day After Tomorrow’ and the idea of just leaving the world to the ‘pumpkins’ was born. HELLOWEEN‘s last album, “Straight Out Of Hell”, sold around 4,100 copies in the United States in its first week of release to debut at position No. 97 on The Billboard 200 chart. The CD entered the Media Control chart in Germany at position No. 4 — the highest chart position in the band’s history. It also landed at No. 4 in Finland and No. 2 on the international album chart in Japan. “Straight Out Of Hell” was released in January 2013. The cover artwork for the CD was once again created by Martin Häusler, who previously worked with the band on the “7 Sinners” and “Gambling With The Devil” CDs.